You know I love a good hat costume, so this week has inadvertently turned into hat costume week... And I've got one more for next week. They're just so practical! Jaime: I want to make something fun for Halloween. Jake: You should make a witch hat. Jaime: There are a ton of adorable witch hats out there, everyone has a witch hat. I want to do something different. Jake: If it's your version, it would be different. You should make a witch hat. Jake: Then make a Lawn Gnome hat, but I really think you should make a witch hat. I consulted the Oracle (Google search) and realized it wasn't a witch we were thinking of at all! 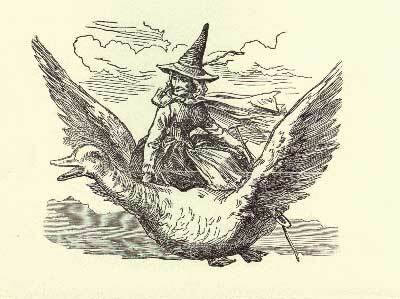 It was Mother Goose! 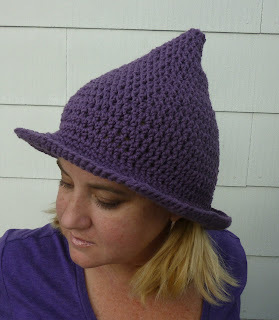 So if you'd like to be something different, something that hasn't been seen a billion times on Pinterest, and you'd like to rock a funky witch hat, this is absolutely the pattern for you!! 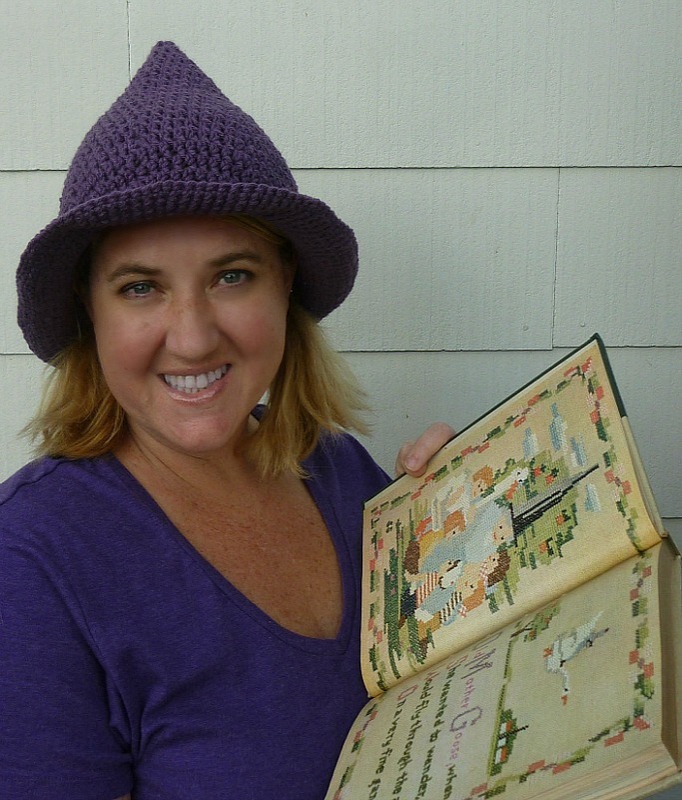 Oh my gosh - you are so adorable and the hat is too! I remember seeing Mother Goose outfitted in hats just like that when I was a kid! Maybe I've seen that same woodcut image before. Anyway, it's perfect. Also, nice match to your shirt, LOL! Speaking of Gooses (geese), we need to find that one that lays golden eggs! and I actually changed my shirt so that I matched... I don't normally costume up for the pictures, but it made me laugh! Heh, heh, heh.... we just found out the minimum costume for the Halloween thingie in our apartment complex is a hat. Wah-hoo! I'm thinking it would be bitchin' in all the colors I have scraps of. I'll go as Mother Schmoose! This looks like a perfect pattern for a Beauxbatons hat for Harry Potter fans! Zoh my Potter!!! It IS a Beauxbatons hat!!! LOL!!! How delightful!!! Well, that makes me want to change its name... :D I am awarding you triple Dynamo points and 50 points to Gryffindor. 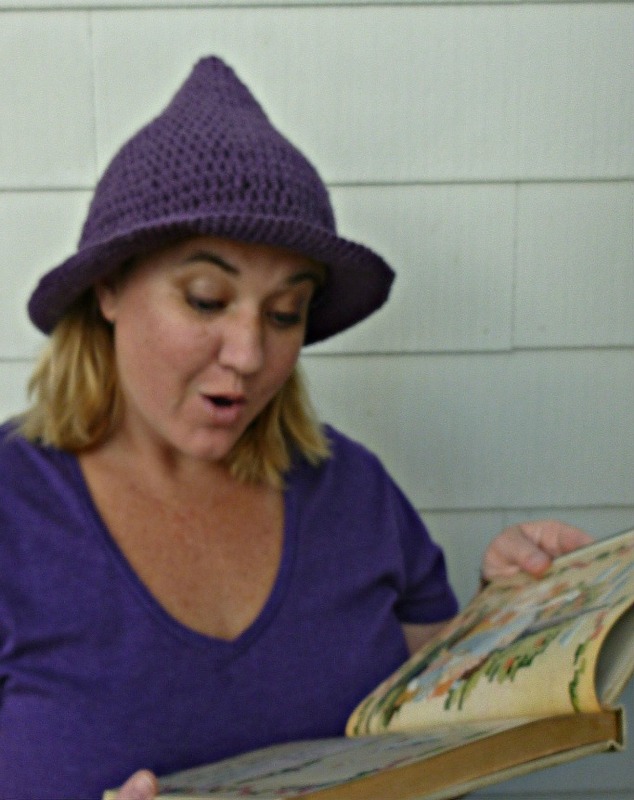 I have an unusually large head that I MUST make this hat for. If I follow the pattern completely, what will the measurements be?